With 2,000 meters left in the weekend’s World Cross Country Championship, 20-year-old Ugandan Joshua Cheptegei was leading the most important race of his young life, in front of the home crowd. The glory was his; he had almost 50 meters on pre-race favorite and cross country legend Geoffrey Kamworor. The crowd in Kampala was going wild. Cheptegei was sailing. Smooth, untroubled, strong—you could point to him and confidently say, “That’s what running is supposed to look like.” Knees high, chest forward, the look of a champion. Sure, he’d already run a blistering 8000 meters, at a pace the very experienced Kamworor would later called “suicidal,” but see—he was clear, he was going to keep it up. With only five-ish minutes of running remaining, he was invincible, focused, glorious. At least, that’s what it looked as an outside observer, unable to see Cheptegei’s brain or heart. “Here’s what happens normally,” sports scientist Ross Tucker explained via email. “The brain monitors the body’s state of health—how hot it is, how much energy is in the muscles, in the blood, the osmolality, how much oxygen is available primarily to the brain, blood pressure. It was glorious, too, because Cheptegei was a hometown hero, a Ugandan beating perennial powerhouses Kenya and Ethiopia on Ugandan soil, even leaving his mentor—countryman Stephen Kiprotich—in the dust. The last of five circuits of Kololo Independence Grounds would be a victory lap, a coming-out ceremony for running’s next big thing. With just 2000 meters to go, you can probably guess what happened next. The camera panned away from Cheptegei, and when it came back he was a terribly different man. The champion had drained away, and the shell that remained could barely lift his knees. Though he was still leading, gone was the unified mission of forward movement; individual body parts made disjointed efforts to regain the smooth coordinated movement that seconds earlier had seemed so easy and natural. Cheptegei’s face too registered surprise, then despair. 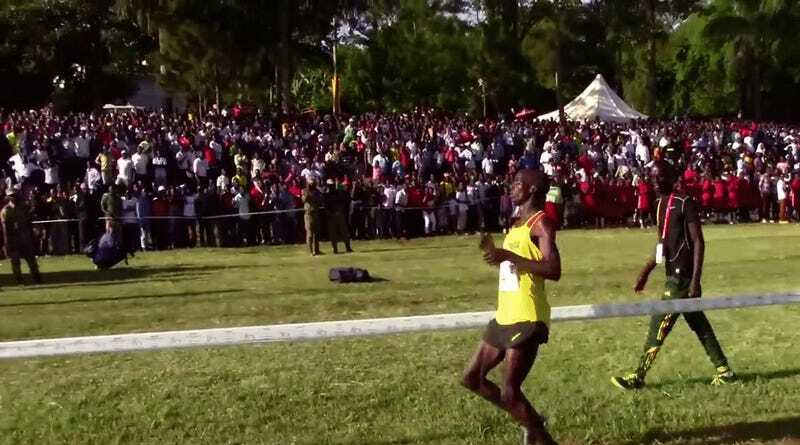 About 600 meters from the finish line, the hard-charging Geoffrey Kamworor swept past Cheptegei, who subsequently disintegrated. Head back and held stiffly to the side, Cheptegei staggered, lurched, tottered, wavered, tiptoed. He slid his hand along the tape that marked the winding path to the finish. The last 600 meters took him an excruciating four minutes. Miraculously he crossed the finish line without assistance or flat out collapsing, as the crowd watched, horrified. “In the end, it’s so dramatic because his courage and mental effort have overridden normal regulation to the point where his body has to use its final ace to protect him,” Tucker said. Amazingly, Cheptegei’s heroic finish made him the fourth scorer for team Uganda, helping his country to a bronze medal. Despite the implosion, he crossed 30th out of 146 runners, in 30:08. To put his blistering pace through 9,400 meters in perspective, Cheptegei tottered home just four seconds back of the U.S.’s fourth runner, Stanley Kebenei, who was in full control of his physical being. As quick and utter complete as his collapse was, Cheptegei’s recovery was equally remarkable—minutes later he was accepting the team bronze medal and chatting with Uganda’s president. Just 20 years old, Cheptegei has won junior titles, and even competed at the Rio Olympics. He’ll be competing in elite races for a long time, and the next time his brain starts yelling at him to hit the brakes, he’ll probably be more likely to listen. But since he’s so young, his already exceptional physiology may have improved to a point such that he’s already crossed the finish line, in first, when that happens.